Wreck-It Ralph comes out this weekend. The film, Disney's newest animated feature, seeks to do with video games what Toy Story did for toys of the non-digital sort, and tie into nostalgia for the 8-bit era. Pulling off a retro look seems simple but was deceptively difficult for the studio, the filmmakers explained to the New York Times. Animator Wayne Unten recalled explaining to the director, Rich Moore, that pixels rule the 8-bit world. "I was seeing things where, instead of two pixels wide for the eyes, it was one and a half pixels. And to break a pixel into a half was a big no-no for me. That's not how it was in the games. I would say, jokingly, ‘We have to respect the pixel.'" Jokingly, perhaps, but a touch that no doubt purists and viewers who remember the 80s will appreciate. Throughout production, 8-bit images consistently had to be scaled back: made less realistic, less curved, less fluid. Moore said that at first, that didn't sit well with the animation team: "They're used to classic, realistic animation, and this style goes against everything that they've ever learned about what makes good animation." Eventually, though, squarer heads prevailed. 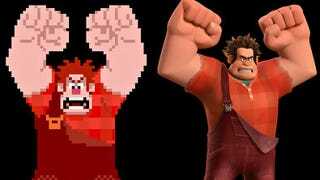 From trailers, it seems that inside his game, Ralph—and his nemesis, do-gooder Fix-It Felix—do indeed feel like they fell out of a thirty-year-old arcade. As for how it works in the film? Most of us can find out this Friday.